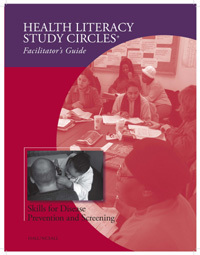 The goal of this 15-hour study circle+ is to prepare participants to help their students develop basic skills needed for engaging in disease prevention and screening activities. These skills include decision-making, using graphs and charts, calculating percentages, and interpreting risks and probability.These skills include decision-making, using graphs and charts, calculating percentages, and interpreting risks and probability. This guide provides all the necessary materials and clear instructions to plan and facilitate a five-session study circle. Each session lasts three hours.